I was spoiled for choice for this edition of Friday Five but there are still only four things on the list… My internet has gone a bit wobbly and I want to press ‘publish’ before it dies completely. Enjoy! 1. This one comes courtesy of some book-research which got out of hand. I began looking for bird-themed ceramics on Etsy and, as if by magic, lost six hours of my life. 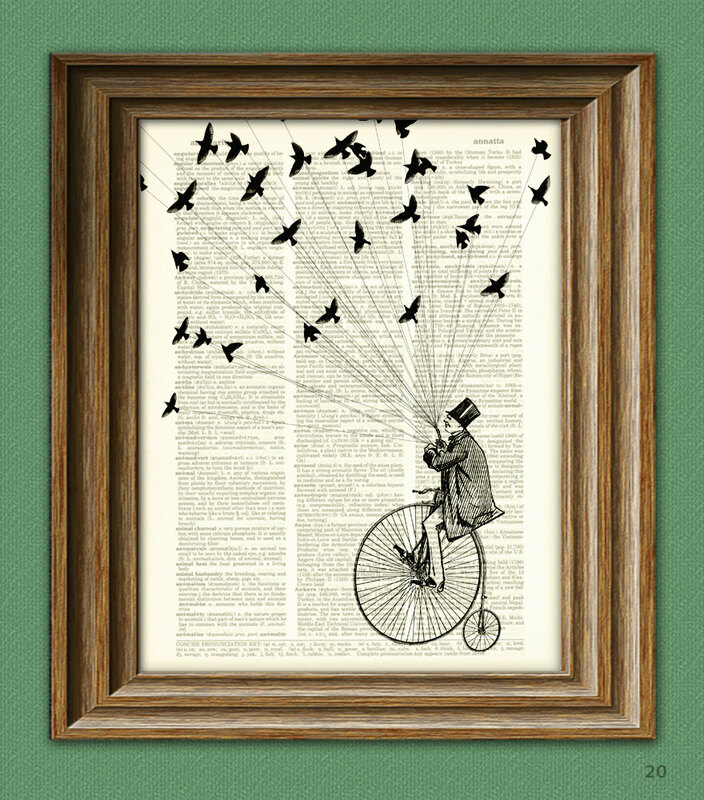 Steampunk Bicycle print ‘The Sparrow Thief’. CollageOrama upcycles old dictionaries by printing bold images on the pages. 2. Even though I am personally freaked out by the depth of the ocean, and find it difficult to think about that volume of cold dark water without nausea, I couldn’t fail to appreciate the brilliance of this graphic by the BBC. It illustrates the awesome depth of oceanic trenches in a clever and informative way. As long as I don’t picture myself in a tiny boat floating on the surface, I’ll be fine. Urp. 3. March 8th was International Women’s Day 2012 and although I actually intended to post about it yesterday, I’m going to pretend that I’m a day late in order to make a statement about gender equality being relevant every day. Also, check out this excellent article from The Huffington Post: 10 Reasons Why Feminism is Good For Boys and Men. 4. An inspired (and very patient) crafter has built a Tardis in a bottle. Cool.